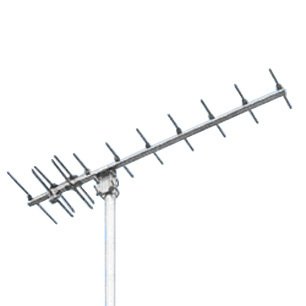 The Y103B-400 is a horizontally polarized 360-440 MHz 10 element yagi data communication antenna for two way radio. The use of multiple driven elements allows these Yagis to achieve high gain levels throughout their entire specified bandwidths. A single TACO Yagi's operational band typically covers a frequency range that would require as many as 3 standard Yagis. Crafted from high strength aluminum, they utilize stainless steel hardware for excellent corrosion resistance. Each unit is furnished with an integrated 50 Ohm N-Female connector, and is capable of mounting to a mast range of 1.5” to 3”OD.